"The Office of Sheriff is one of antiquity. It is the oldest law enforcement office known in the common law system, and it has always been accorded with great dignity and high trust" - Walter H. Anderson, in Sheriffs, Coroners and Constables. The Sheriffs of Washington are elected and are constitutional officers within the Constitution of the State of Washington. In order to improve and provide effective service and protection to all citizens of Washington, the 39 Sheriffs joined together in 1984 to form this Association. This joining together of the Sheriffs has allowed the Sheriffs to assist each other in fulfilling their duties and obligations to the people of this state as the chief law enforcement officers of their respective counties. To better serve and protect the people of Washington State, and to uphold the Constitution and laws of the State of Washington, and the United States, the mission of the Washington State Sheriff’s Association (WSSA) is to promote ethics, professionalism, leadership development, training and dialogue among its members and the law enforcement community. To preserve and protect the office of Sheriff. To be a unified voice addressing local, state, and federal lawmakers on criminal justice issues. To improve public awareness of criminal justice issues. To study emerging common issues and develop responses. To maintain a close working relationship with WASPC on issues of mutual concern. To provide a centralized body through which prompt cooperation may be had with other public officials and bodies in performance of their duties. To provide immediate support to fellow sheriffs, law enforcement officers, and their respective agencies in times of need. (6) Shall keep and preserve the peace in their respective counties, and quiet and suppress all affrays, riots, unlawful assemblies and insurrections, for which purpose, and for the service of process in civil or criminal cases, and in apprehending or securing any person for felony or breach of the peace, they may call to their aid such persons, or power of their county as they may deem necessary. In addition to the duties contained in RCW 36.28.010, it shall be the duty of all sheriffs to make complaint of all violations of the criminal law, which shall come to their knowledge, within their respective jurisdictions. 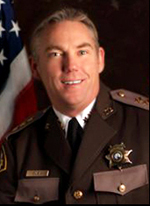 Thurston County Sheriff John Snaza is the current president of the Washington State Sheriffs’ Association. Sheriff Snaza is an active member, and currently the President-Elect, of the Washington Association of Sheriffs and Police Chiefs as well as several other local and state professional organizations. As with many other laws, the application of Initiative 1639 will undoubtedly vary from county to county across the State, based on local priorities and resources available. We will continue to monitor the process as the Courts weigh in on any challenges, and look forward to working with the people of the State of Washington to improve public safety in all of our communities.